Record-breaking torrential rain in the west of Japan has claimed at least 80 lives, while dozens remain missing. Over 50,000 rescuers have been deployed to the area, where hundreds of people remain stranded. The rain triggered massive landslides and heavy flooding, with many houses becoming damaged and submerged up to their rooftops. The bad weather unfolded earlier this week as the remnants of a typhoon hit western Japan. 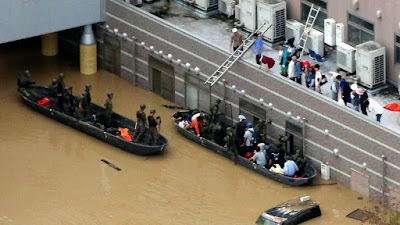 According to the Japan Times, the death toll has risen to 81 on Sunday, while dozens remain missing. At least 1,850 people were temporarily stranded on Sunday in the city of Kurashiki, including some 160 at a local hospital. Japanese military and civil rescuers had to step in and evacuate patients and staff on boats. Some patients have been airlifted by a helicopter on stretchers. However, around 80 people remained at the hospital as of Sunday evening, according to the NHK public broadcaster. Roads remain flooded and damaged across western Japan, with some communities still cut off. Railways have been also affected by the disastrous weather, with many bridges washed away and tracks inundated, according to local media. Around 54,000 rescuers are engaged in the search operation with police, firefighters and military scrambling to assist the victims of the flooding. Some 30,000 people remained in shelters on Sunday, while the evacuation orders and advisories were issued for nearly 6 million people, according to the Fire and Disaster Management Agency.